The leading cause of bridge collapse in the U.S. is scour, an erosion process where water flow carries away river bed deposits and creates scour holes around a bridge pier or abutment. Floods intensify the problem and can quickly make the bridge unstable. In the foreground, a passive smart rock contains a magnet suspended in liquid. In the background is a concrete-encased smart rock that is about the size of a basketball and weighs about 50 lbs. But gauging a bridge’s structural stability can be difficult when its foundation is buried in a riverbed, deep below the water’s surface. 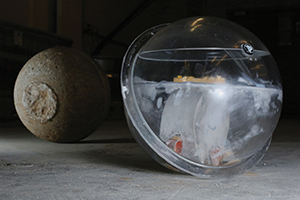 Researchers at Missouri S&T are creating “smart” rocks with embedded sensors that are designed to roll near the foundation of an underwater bridge and provide accurate real-time data at the surface. They’re an easy and cost-effective tool to monitor the bridge’s structural health, says Genda Chen, the Robert W. Abbett Distinguished Chair in Civil Engineering at Missouri S&T. A major concern for scour monitoring is how well the technology holds up during a flood event. But the researchers are seeing good results with smart rocks installed in 2012 at Missouri’s Gasconade River Bridge and Roubidoux Creek Bridge. The rocks will last forever and the battery survives about five to 10 years, depending on how often data is collected, Chen says. The researchers hope to partner with state departments of transportation for further studies. Chen is working with David Pommerenke, professor of electrical and computer engineering, and Rosa Zheng, associate professor of electrical and computer engineering. This technology (patents pending) is available for licensing through the S&T Center for Technology Transfer and Economic Development. Contact Eric Anderson at 573-341-4690 or ericwa@mst.edu.